I've written about this whiskey before, first when it popped up in South Africa in October 2010, then again in May 2012 when it arrived in Ireland. It has recently been relaunched here with a slight rebranding to "Select Reserve Black Barrel" (it was always thus in the US but in Ireland and South Africa it was "Select Reserve Small Batch"). I've learned some surprising things about this whiskey since I last covered it. Freshly dumped bourbon barrels are selected and graded. The internal surface of the cask is prepared for an additional charring process. The charring process of the cask commences using specific temperatures and time profiles agreed with Midleton's Master of Maturation. The extra charring contributes an enhanced vanilla sweetness on the nose and taste. Each cask is inspected by Midleton's Master Cooper to ensure the correct specification of extra charring. Some of the pot still component in Jameson Black Barrel is matured in these extra-charred casks, hence the name. The rest of the pot still is matured in the normal ex-bourbon or (gently toasted) sherry casks. Black Barrel is a pot still-heavy whiskey but it's still a blend so there's a grain component in there too. This is where the other surprise comes in. Grain whiskey in Ireland is made from maize (corn) in a very efficient column still (ie, not in a pot still) that produces alcohol at around 94% ABV. The still could achieve a higher purity but is deliberately dialled back by law to preserve some flavour from the original ingredients. The grain whiskey in Black Barrel, in contrast, is made from a mash bill of malted and unmalted barley - the same starting point as Irish pot still whiskey. The fermented wash is first distilled in Midleton's wash pot, and then distilled in two of the three columns of Midleton's column still (they count each column of the column still as a separate distillation so this preserves the whiskey's "triple distilled" status). This is only done once a year, which is why the original name for Black Barrel was "Small Batch". I've never tried a malt/barley grain whiskey on its own so I can't judge its flavour compared to a maize grain whiskey, like Greenore. The only description I have of it from Jameson is "sweet". The unusual grain whiskey component gives Black Barrel a rather unique claim. The maize used in other blends doesn't grow in Ireland (not in the commercial quantities required, at least) so it's imported from France. Black Barrel doesn't have this French contribution so it is, by my calculation, the most Irish of Irish blends. Rich and full, developing into the succulent sweetness of exotic fruits like nectarines, apricot and papaya. A burst of flavours combine to produce a creamy, luscious taste experience. The special fruity sweetness from the grain remains consistent, while the waves of vanilla, toasted wood and spices roll through from the pot still whiskey and flame charred barrels. An incredibly long finish with fruit and wood spices lingering in perfect proportion, delivering an extremely rich and luxurious taste experience. The recommended retail price is €45. Jameson Black Barrel was (re)launched in Ireland on October 24th at the first event in The Jameson Black Barrel Craft Series. This was the first in a series of intimate workshops celebrating Irish craft and craft makers. 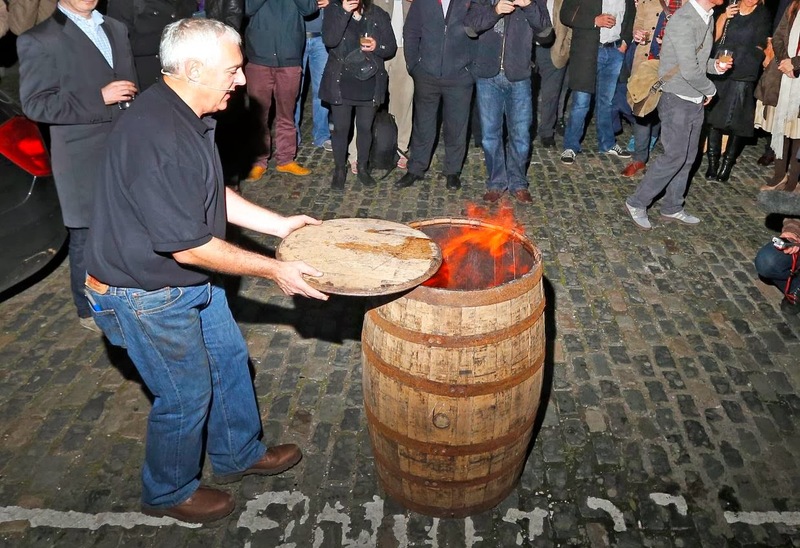 Midleton's Master Cooper, Ger Buckley, disassembled and reassembled a cask, then flame-charred its interior. 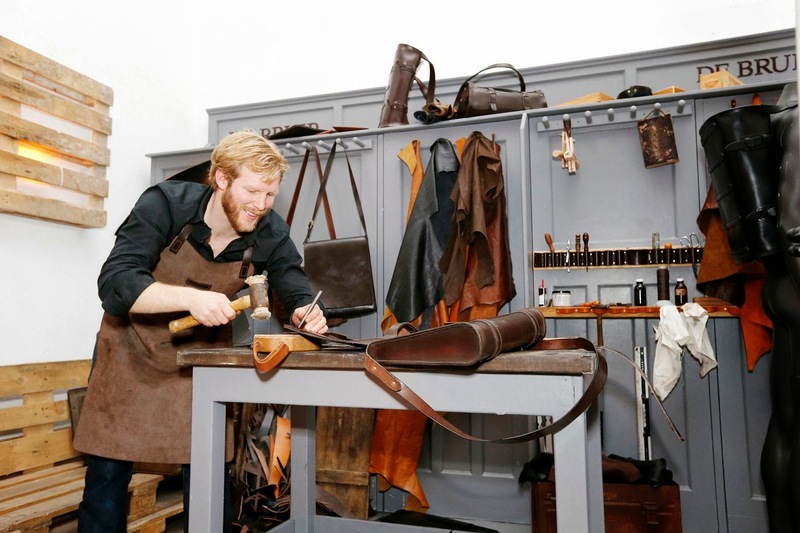 At the same event, Garvan de Bruir demonstrated the leatherwork that his studio in Kildare town is renowned for. I love that Irish crafts are being showcased in this way and, of course, that the craft of whiskey making takes its rightful place among them. Midleton has accumulated centuries of experience with a complex process and it shows in some of the world's best spirits. Every bottle of Irish whiskey is an artisan product, even if it's produced at a global scale, like Jameson. The next workshop in the series takes place on January 30th, 2014. You can register for free tickets on the Jameson Black Barrel tab on Jameson's Facebook page.